If you are able to build a loyal following for your website, success usually follows: fans of your site are more likely to share your content on social media, visit regularly, and buy whatever it is you’re selling. As a result, building a community around your website is a good long term target for all aspiring webmasters — which is easier said than done, of course! 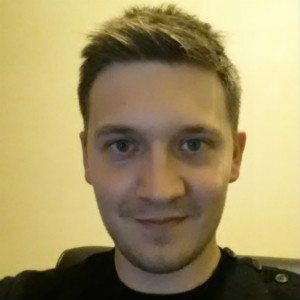 How do you build this community? Awesome content and a user-friendly website are musts, but you also need to cultivate a higher level of engagement among visitors. Encouraging an active comments section is a great place to start, with visitors able to interact, ask questions, and enhance the discussion. However, some popular websites take this one step further: they launch a forum. Today I want to talk about the benefits of adding a forum to your WordPress website, as well as provide practical advice for forum solutions. Why add a forum to your website? People want to be entertained when they visit a website, but they also want information that can help them with their current predicament. Now, most of you will develop article ideas designed to solve specific problems. While this is a great strategy, don’t forget that writing articles is a time-consuming process — with all the research, editing, and formatting involved. Articles tend to be relatively lengthy, too, comprehensively covering an entire topic over the course of a post. But what about smaller tidbits of information that just don’t justify a dedicated full-length post? A forum is the ideal place for such a discussion. Armed with these extra snippets of information, your forum can grow to become a genuinely helpful resource that complements your main website — the two together allow a more comprehensive coverage of topics in your niche. Whether a visitor solves their problem by reading a published article or a forum post is irrelevant. All they will remember is where the help came from: You. And, in turn, the goodwill this generates will result in more recommendations, social shares, and loyal fans. The comments section below an article is supposed to further the discussion — as a result, most webmasters will try to keep their comment section relatively on-topic. This is perfectly reasonable, but there is one problem with this: visitors only have a limited number of topics to discuss. Even if you have thousands of articles published, you’ll find the comments sections of individual articles become deserted after weeks, if not days. Of course, passionate visitors will want to discuss a wide range of topics. A forum provides an ideal place for them to converse with likeminded people. Have you ever thrown a search term into Google only to find the SERPs dominated by forum threads? Like the comments section, every post in a forum is indexed by the search engines — known as user-generated content. If you have a particularly active forum, the contributors can actually help you to boost your visibility in the SERPs. Depending on the topics of conversation, you can find yourself raking in traffic for keywords you weren’t even targeting. Take a look below the content on your favorite blog and what do you see? A set of comments on the main article, usually directed at the author, with very little in the way of discussion. Of course, it is possible to see some in-depth conversations developing, but most comments are left and then forgotten — even those offering something insightful often have little intention of following up. This is in contrast to comments left in a forum, where contributors are actively looking for a discussion. They ask questions, offer solutions, and attempt to further the conversation with a genuine interest in returning to your website to check responses at a later date. As your website grows, so too will your inbox. Many emails received will be from visitors directly reaching out for help — often asking the same questions to solve the same problems. Reading and responding to each message individually is an incredibly inefficient use of your time: your response benefits just one person. A forum is a great solution to this problem. That’s not to say that running a forum is effortless, but it’s a more efficient use of your time: instead of responding for the benefit of one person, your words can now assist your entire community. You will also find that other contributors are willing to ease your workload by submitting their own opinions and solutions to help community members. If you’re sold on the benefits of adding a forum to your website, it’s now time to look at the practicalities. There are a wide variety of options available to you, but I want to keep things simple by recommending two simple solutions. If you want to avoid the headaches associated with disruptions to your main site, consider building a dedicated forum on a subdomain — this allows you to install a separate theme. 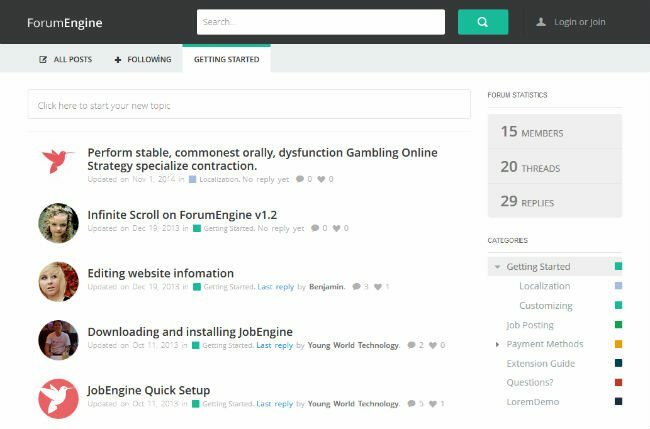 If you want a dedicated forum theme, look no further than ForumEngine, available for $53 from ThemeForest. 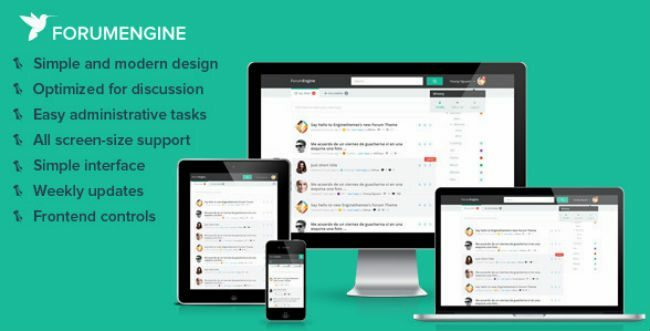 ForumEngine lets you build beautiful, responsive forums. The forums design is clean and stylish, and includes a custom avatar for each user. You can also color coordinate different categories for more aesthetic appeal. There is a strong focus on usability, and ForumEngine makes it as simple as possible for users to sign up and start contributing — they can login using Facebook, Twitter, or a dedicated account. When logged in, users can favorite posts, and follow the threads they’ve contributed to. An admin panel provides you with complete control over your forum. From here, you can set sticky threads, edit user permissions, and also assign administrator status to your preferred users. There are a number of widget areas, most obviously in the sidebar area. From here, you can add all sorts of cool things to encourage user contributions, including top contributor widgets, forum statistics, hot topics, and categories. As an added bonus, this forum theme includes infinity scroll to help with load time — your entire forum won’t be loaded up front, with older threads loaded only when a user scrolls down the page. There is also a search function to help visitors find topics of interest. If you want a quick and easy way to integrate a discussion forum to your main website, look no further than bbPress. Developed by Automattic, bbPress is the King of forum plugins, and to date has more than 1.5 million downloads. While it is less sophisticated than other forum plugins, bbPress is lightweight and intuitive. The emphasis is on speed, security, and simplicity — to see it in action, head over to the WordPress repository discussion forums. Because the plugin uses the existing WordPress core, users will feel right at home when setting up and running their forum. In fact, your entire forum is managed from the WordPress dashboard. bbPress adds a forum contributor to the default user roles, and from here you can alter permissions, and even upgrade certain users to admin status. You can also customize the style of your URLs in the same way as you set your permalink structures — everything feels familiar. In the past, developers would market their themes as “bbPress compatible” as a major selling point. All this changed when a recent update added theme compatibility, meaning bbPress can now run with any WordPress theme. If you want more from your discussion forum, bbPress functionality can be extended with a number of other plugins. Head over to the bbPress plugin section to see almost 200 plugins that are compatible with bbPress. Adding a forum to your website is an exciting project, and one that can really enhance your engagement with your audience. Of course, how you go about adding a forum is up to you — there are plenty more forum solutions out there, but I find these solutions to be the best, especially if you’ve never integrated a forum before! How did you add a forum to your WordPress website? Let us know in the comments section below!